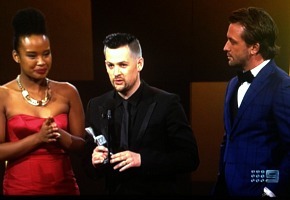 The TV WEEK 55th Logie Awards are underway in Melbourne. First presenters were Hamish & Andy in two Voice chairs (on wheels) and launched into some gags about Bauer Media taking over TV Week and Hamish Blake carrying last year’s Gold Logie. Asher Keddie thanks Rick Maier, TEN’s drama exec for his ongoing support. After TEN’s turbulent year, so she should. 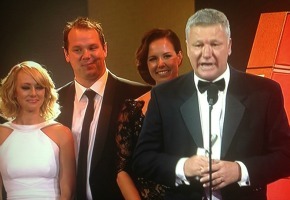 Julia Morris delivers a fun acceptance speech as only she can, but Gary Sweet is nowhere to be seen. Madden thanks “Or-stralia” several times after this controversial win. Will McDonald must be wondering what he has to do to crack it in this industry. Adam Hills drops a political gag in favour of our cushy lifestyle under the current government. Did he see the media reforms? Johanna Griggs accepts again. Will another show ever topple this one? Producer Darren Dale thanks the ABC and acknowledges black faces on ABC in primetime. 2013 was the year of Indigenous television, but every one of those nominated could have won this tough category. Molly Meldrum gets a standing ovation (presumably in lieu of his Hall of Fame award last year). 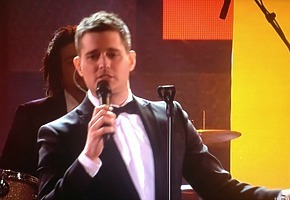 He thanked industry, hospital staff and viewers for his support. But finally he provides the first memorable moment of the night by dropping the F-Bomb. Thank goodness! Julia Morris and Dr. Chris Brown so far deliver the best presentation moment as Morris jokes with Dr Chris. about acting school. Brian Henderson is inducted into the Hall of Fame, introduced by Mike Munro, and greeted with a standing ovation. The congrats from fellow newsreaders was a nice inclusion. Hendo dropped plenty of gags in his acceptance speech, including a gag about not spoonerising the name ‘Chuck Faulkner’ on Bandstand. “I want to thank all those people I worked with, including all those people who plotted to take my job. 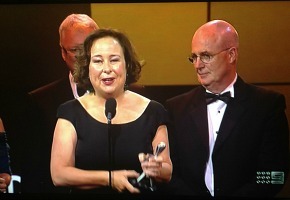 And at 10:25pm as I write this, News Limited has leaked the Gold winner. A tearful Brenna Harding said “I’m so lucky.” A sweet moment. NRL Footy Show wins yet it’s ratings are so low. AFL version trounces it. Hmmmm. Hurrah. A deserved win. [email protected] the Foxtel exec who tweeted it too soon. 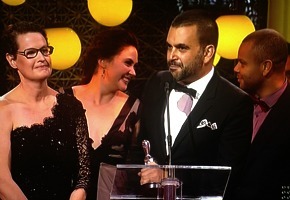 Breaks Homicide‘s record of 5 consecutive Logies for a non-news programme. So why are it’s ratings also so low? Didi And B, Nick Jr.
Dance Academy is such a joyous show. 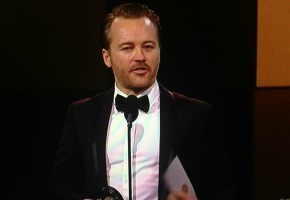 Can I just say, Dear Logies -you really need a host. Sarah Ferguson tells Nine “no poaching” of the Four Corners staff. Dave Hughes is working the room, with plenty of gags that are going over well. 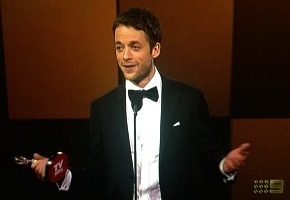 Hamish gushes over Andy Lee, “I figure you will get Gold” and he wants the compliments in return. With all these Bert announcements for Gold, I’m expecting him to present the big one. Finally the In Memoriam section, introduced by Peter Overton and starting with Peter Harvey. A stirring vocal performance by the Melbourne Gospel Choir. Has the autocue stopped working? Everyone is reading off cards. 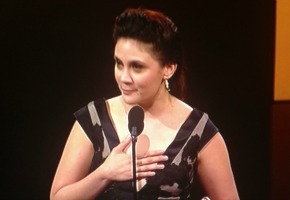 A popular win for the tearful Deborah Mailman on Benita Mabo’s own birthday. The room gives another standing ovation. Benita Mabo thanks those involved with the production. 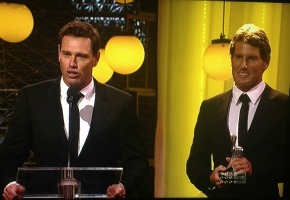 It’s spontaneous moments like this that makes the Logies. Just as well Seven picks up another gong. Top rating network is not having much of a good night. I remember some execs grumbling to me about that two years ago. Lachy Hulme is robbed. 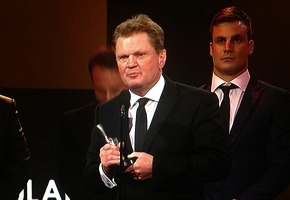 Not to take anything away from Anthony Hayes but Lachy Hulme did Offspring, Beaconsfield and Offspring in one year. Sheesh. 12:08am I’ve just received the winners press release from Logies publicist and the Gold hasn’t even been announced on TV. How does this make sense? Hurrah, here’s Bert! Still got it. About bloody time! As tipped by TV Tonight readers in 2012. I think people are being a bit sensitive over Adam Hills’ remark about Steve Peacocke. All he really said was he didn’t really know who Steve was. If anything he’s just being honest. Hardly a hanging offence and I’m sure out of the Gold Logie nominees Steve was the one least known to people who don’t watch Home And Away or read TV Week. I was more offended by Dave Hughes’ attempt at jokes about the contestant who died on Survivor… more so because the show’s doctor had later committed suicide (which Dave didn’t mention but just knowing that had happened made his comments all the worse). Not funny. Scratch that… Ashleigh Cummings was for Most Popular Actress, for Puberty Blues and Miss Fisher’s. 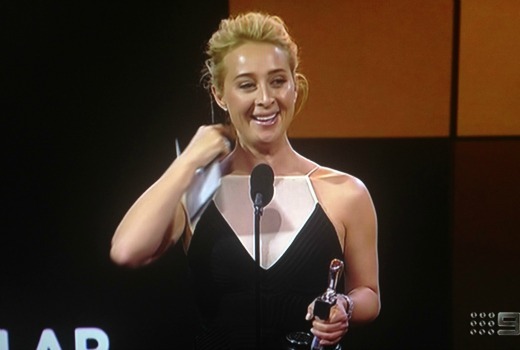 Asher Keddie wins a Gold Logie… at long last. Her career has taken off since Offspring! Bondi Rescue won most popular factual program though I must say I haven’t really enjoyed the new series as much because it lacks a narrator and it seems disjointed. Dance Academy is a very good show and it is a very bold programming move, its a teen drama at its own level. 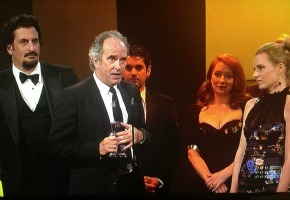 Howzat was an exceptional telemovie, I saw all of the nominated ones except Jack Irish and any of them deserved to win. On the subject of telemovies, Mabo might not have been a success in terms of viewers, but it was a success critically. I will weigh into the Joel Madden debate and I will agree it was farcical. Don’t get me wrong, he is a great coach on the Voice but I would say it was a few Good Charlotte fans that voted for him seeing that it was a Most Popular. Awwwe shucks. 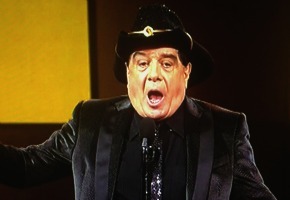 I missed the Logies ….. again! Did Tricky Business win anything? 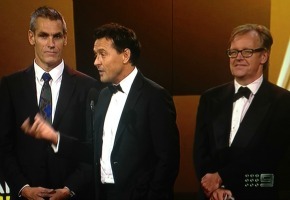 Overall I enjoyed the Logies last night. I cringed though at Adam Hills bad joke about all actors being mental. Then commenting he didn’t know who the winner of the most popular actor was. I felt sorry for the winner then having to get up on stage and make a speech for what should have been a proud moment for himself. You could see the poor guy was upset and thrown by Hills callous remarks. Humour that puts other people down like that just shows why people are switching off Hills programs in droves. He’s not the performer he used to be and just comes across now as rude and holding a grudge for his shows not being popular with viewers anymore. Brilliant coverage, as always, David! Aside from finding them far too long and in desperate need of a host, (Buble singing in key would have been nice, but I’ll take drunk as an acceptable alternative) I thought it was probably one of the better ceremonies in recent years. My only real issue was in the ‘Breakfast TV’ memorable moments section. Aside from the fact that they included Breakfast and not The Circle (or News Breakfast), but the bulk of the package was made up of Paul Henry laughing at Sheila Dikshit name. That occurred in 2010 on the New Zealand version of Breakfast. Did no one fact check? 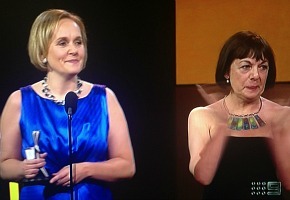 Did not one person question who the other presenters were? Or the TV3 indent? 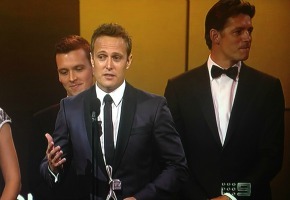 I’m happy Joel won for best new talent it would have been worse if David Campbell won. He was already in DWTS as one of the “stars”, plus he was in GP in the 90s, so how is he a new talent on Aust tv? I, too, add my thanks to David for his excellent coverage. The Logies are an Australian institution and although I don’t always agree with the winners/nominees, I always look forward to them each year. I know I’m not alone. I feel bad for Joel Madden. He’s offered employment on Australian TV as a judge/mentor and he does a great job of it. His network submits him as a nominee for “Most Popular New Talent” and enough people vote for him to see him win the award. All hell breaks loose. Why? Because he’s a popular, well-known singer and (shock horror) not an Australian. The fact that this is his first TV role seems to have escaped everyone’s attention. We had this discussion when the nominees were announced. What is the difference between Daniel Kowalski and Matt Shirvington being nominated? Should Bob Irwin have been nominated, since he’s been on TV since birth? People need to lighten up. I watched…well, what I thought was the last hour….turned out to be 2 hours…..missed Brian Henderson….and Michael Buble?…..
Just my theory…as awards on this show are voted by the public?…internet and so on….perhaps the winning shows and actors are what folk are really watching….and not what the ratings reflect….just wondering. I can’t believe they left Australian actress Patricia Kennedy off the “in memoriam” list who sadly passed away in December last year at the age of 96. She was a recognisable face who appeared in many shows in everything from Prisoner, The Sullivans, A Country Practice, Homicide, Return To Eden, GP, Young Ramsey, Five Mile Creek, The Flying Doctors, Holiday Island as well as countless movies, including getting nominated for an AFI award in 2 critically acclaimed ones “My Brilliant Career” and “The Getting Of Wisdom”. Such an oversight for an excellent and recognisable Australian actress. As for Asher Keddie the best thing I have ever seen her in is the 1985 Australian movie “Fortress” with Rachel Ward. Saw it as a kid and to this day have never forgotten it. TV Week Logie voters are not a representative sample of the the total TV viewing audience. Most popular drama usually means your show wasn’t good enough to be nominated for Outstanding Drama and more viewers watched other shows but here is a statue for trying. I only watched the last hour of the telecast but know what happened with the recap during the end credits. 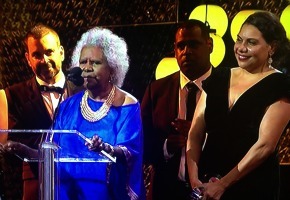 Deborah Mailman and Benita Mabo. What a touching and inspirational moment. I almost shed a tear too and would love to know if Peter Reith joined in the standing ovation or not. (I’m betting Not). Dave Hughes – this guy is always hilarious but never seems to be nominated for any of the popular awards. Popular Presenter for Before The Game next year please. 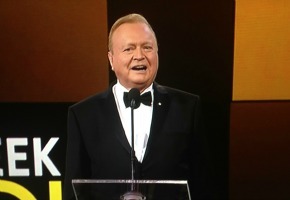 Bert Newton – this guy is a legend but his hilarious speech was marred by his remarks about Channel 10. Doesn’t he realise that after 9 gave him the boot the only network that gave him a job was 10? Seriously Joel Madden for Best New (Australian) talent??? 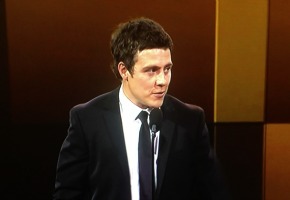 This award will go down as one of the most embarrassing awards given in Logie history. What next? Ricky Martin for Gold next year? Sonia Kruger’s snarky remarks about Network 10. Dear Sonia – your precious 9 was on the verge of bankruptcy a few months ago. People in glass houses you know. Never liked this woman. BTW – the people complaining why low rating programs are winning the most popular awards should understand that the Logies are about which shows and artists the most network employees can go online and vote for. It’s not hard to get 1000 network employees to go online and do what the CEO tells them to. This would explain why the likes of Joe Madden, The Block, House Husbands and Hamish Blake won ‘popular’ awards this year. The fact that the winner was leaked online for the second year in a row demonstrates what a farce this awards show is. This would never happen with an overseas awards night. I thankfully avoided most to it, but what I did see was abysmal. The on screen graphics looked like they had been pulled from the late 90s while the camerawork was shaky and amateur. Those table centre pieces looked like something done by a kindergarten class. The show didn’t finish until close to 12.30, which could have been earlier had they bothered to once play out the speech makers. 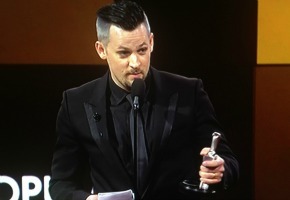 Joel Madden winning for best new talent was an embarrassment to everyone involved. While Eddie McGuire praising Nine during his acceptance speech for Foxtel was a clear conflict of interest and a particular low point and further makes the idea of on screen talent collecting awards for shows that a producer should be winning far more glaring. And naturally, they dusted off old Bert to present the gold. Sigh…. I would have been happy to see either Carrie or Asher win. Just when i thought 9 had rigged, Anthony Hayes trumped Lachy Hulme – big upset. But The Block over MKR? House Husb over Rafters? 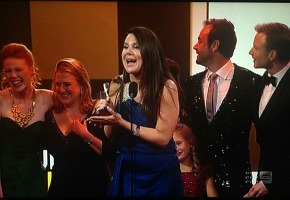 Lovely moment with Deb Mailman, and Shane Jacobson throwing away a mock envelope – a singular great presenting moment! But too long…. 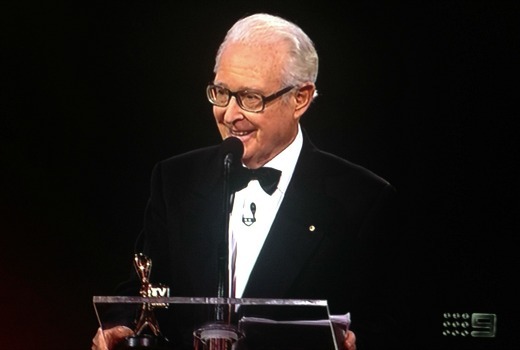 Enjoyable….but needs a host……A bit surprised at some of the winners…….All in all a good night to celebrate Australian TV….apart from House Husbands….I stopped watching when the girl drove the school bus…really ! Interesting that Foxtel won for the Olympics coverage against Nine, well deserved but a bit embarrassing give this was on Nine last night. I didn’t watch the Logies, good thing given it didn’t end until after midnight. Logies went far to long this year. I would’ve have gone back to watching it after downton abbey but when I checked it was too far away from finishing so gave up. I read rob mammones twitter and found it a bit confusing. It was unclear whether he has left home and away or that he was just on holidays. Hopefully some clarification. No disrespect intended, but I thought seeing it is comedy night on 9, I thought I would join in. Re the 12.08 am winners press release, was that before or after channel 9 had no more qualifying nominations?